I attended the anniversary party for the Château de Saint-Albain. Hundreds of people gathered together to sing praises of this wonderful château that serves as our favorite conference center in the heart of the Burgundy region of France. As story after story unfolded about the château, it was clear that everyone believed their season in the château’s history were the glory years. One story stands above the rest. You see, a group of local Bourguignon families wanted to thank a family of caretakers who had worked at the château for over two decades. Bourguignon families are very proud (in the best sense), proud of their land, proud of their culture, proud of their cuisine. 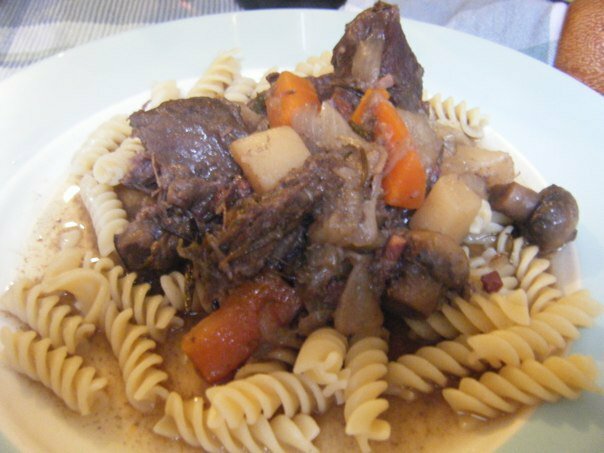 And so, to flatter this couple and make them feel at home, the best compliment they could come up with was, “Thank you Doris, you make the most Bourguignon, Boeuf Bourguignon that an American has ever made!” Followed by an uproar of applause. So try your hand at their traditional recipe, but beware, if you change one ingredient in this recipe they’ll taste it and say, “Nice stew, but that’s not Boeuf Bourguignon.” And you can disagree with them all you want, but in the end they did invent the recipe, so you can’t really complain if they get to decide whether it has been recreated properly. You’ll need a baking casserole that does double duty on the stove and in the oven. Imagine a big thick iron pot with a lid. Mine is stainless steel, but make sure your handles won’t melt. Fry bacon over moderate heat until lightly brown, remove, break into pieces, set aside in your large baking casserole. Cut beef into 2 inch chunks. Dry the beef with a papertowel. Sear beef in bacon fat until brown, set aside with the bacon. In the same fat brown the fresh onion and carrots, remove to a separate bowl. Toss meat with salt, pepper, and flour. Place casserole uncovered in the middle of the oven at 450°F for 4 minutes. Toss the meat and continue baking another 4 minutes until flour has browned. Remove and set oven to 325°F. Empty the bottle of wine and enough stock so that the meat is barely covered. Add the tomato paste, browned onions and carrots, crushed garlic and herbs. Bring to simmer on the stove. Cover the casserole, place in the lower third of the oven. Regulate the heat so the liquid continues to simmer very slowly for 2 1/2 to 3 hours. The meat is done when it falls apart when pierced with a fork. While the beef is cooking, prepare the canned onions and mushrooms by browning them lightly. Add these to the meat 10 to 15 minutes before serving. Check the meat every half hour, if it’s too dry add more stock, by the end of the cooking time the sauce should be gravy-like.